We are entering into the last days of Advent only a few days before the Vigil of Christmas. During these days, our anticipation of Christmas increases in intensity, making us aware not only of how much we have yet to do to prepare for Christmas, but how much we have yet to do to welcome Christ more completely into our lives. With the knowledge that the days of Advent are coming to an end, we are led to those means by which Christ comes to us in the Church and asks us to welcome Him into our lives. I refer especially to the Sacraments of the Holy Eucharist and of Penance. As we anticipate the celebration of Christmas, we want to be with our Lord in the Holy Mass each day, if possible, offering ourselves to Him and with Him in the Eucharistic Sacrifice. We want to spend time with Him in prayer before the Blessed Sacrament, either reposed in the tabernacle or exposed for adoration. We also desire to meet our Lord in the Sacrament of Penance, confessing our sins to Him, with sorrow, and receiving from Him, through the ministry of the priest, the absolution of our sins. There is no better way to make our final preparation for Christmas than to spend time with our Eucharistic Lord and to meet Him in the Sacrament of Penance. At Evening Prayer during the last days of Advent, the Church sings a solemn antiphon before the singing of the Magnificat. On each of the seven days, the Church addresses the Messiah, the Christ, by one of the titles given to Him in the Holy Scriptures. These seven antiphons are popularly known in the Church as the “O” Antiphons, because each one begins with the exclamation “O” before naming the title of Christ from the Holy Scriptures. After the invocation of Our Lord by the title, a prayer to Him follows, begging Him to come to us, to visit us, and to fill us with the grace of the Holy Spirit. The “O” Antiphons are sung at Evening Prayer because “as the Church sings in one of her hymns, it was in the evening of the world (vergente mundi vespere) that the Messias came amongst us” (Abbot Prosper Guéranger, O.S.B., The Liturgical Year). They are sung at the Magnificat “to show us that the Savior whom we expect is to come to us by Mary”(*). The Gregorian Chant for the “O” Antiphons is especially beautiful and expresses the longing of the Church to celebrate once again the great day of Our Lord’s Birth and the desire of each soul to know Christ and to offer Him the home of a pure and selfless heart. The singing of the Antiphons is filled with hope, for indeed we know that the Lord has come and that His great desire is to find in us the response of love to His immeasurable and ceaseless love of all mankind. I offer the example of two of the “O” Antiphons. 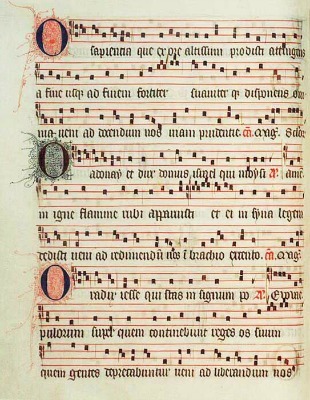 The first of the “O” Antiphons addresses Christ by His biblical title of Wisdom: “O Wisdom, Which comes forth from the mouth of the Most High, reaching mightily from end to end, and gently disposing all things, come to teach us the way of prudence.” The prayer expresses the truth that, in all things, God accomplishes His holy and saving will, and He does so without violence to our freedom, and asks that we might have the prudence which permits us in all things to choose what leads to eternal salvation. The last of the Antiphons addresses Christ by the biblical title which most explicitly declares the reality of His Coming. He is Emmanuel; He is God-with-us: “O Emmanuel, our King and Lawgiver, the Expectation of the nations and their Savior, come to save us, O Lord our God!” The prayer declares the truth that Christ alone answers the longing of every people of every time and every place to know the truth and love of God. Christ reigns by becoming the servant of all, offering His life totally for the eternal salvation of all men, without boundary. Christ is the Lawgiver whose discipline does not distort or destroy human freedom but leads human freedom to its fullest flower in selfless love of God and neighbor, unto death and for all eternity. 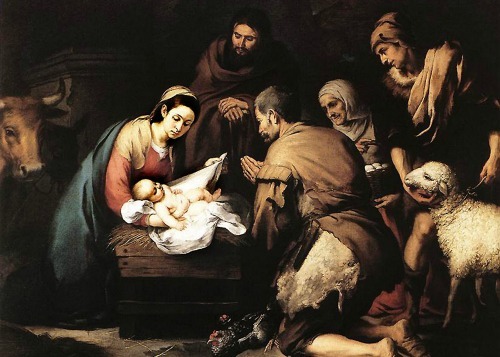 Our final preparation for the celebration of the Birth of the Lord brings us to Christmas Eve. The final hours before Christmas are observed with a great recollection, the concentration of our attention upon the great mystery of the Incarnation, and the substantial and unchanging meaning which it gives to our lives. Whatever may be lacking in our preparation for the celebration of Christmas, in the disposition of our hearts to receive Christ fully into our hearts, the Church’s prayer announces to us: “Today you will know that the Lord will come, and in the morning you will see His glory.” The Church’s prayer points to the reality of the unceasing outpouring of Divine Love upon us in Jesus, the Christ born for us at Bethlehem to die for us at Jerusalem. On Christmas Eve, there can be no place in our hearts for discouragement, let alone despair, but rather our hearts must be filled with confidence in God’s love, with the sure hope that He will redeem us from all our sins, even as He has sent His only-begotten Son to do. How can we doubt the mercy of God Who comes to us in all humility and poverty to be for us our All! He will not permit His plan of infinite mercy and love toward us to fail! May the celebration of Our Lord’s Birth, this year, bring us all a deeper knowledge of how much God has loved us and continues to love us in our Lord Jesus Christ! May such knowledge, which indeed comes most fully to us in the Holy Eucharist, make us the bright and tireless bearers of God’s love to those who find themselves in the darkness of sin!